Homecoming Marine, a Norman Rockwell painting, appeared on the cover of The Saturday Evening Post published October 13, 1945. This is another favorite of Rockwell collectors, a classic enduring image of the world Rockwell painted. This painting was Rockwell's 232nd overall out of 322 total paintings that were published on the cover of the Saturday Evening Post. Rockwell's career with the Post spanned 47 years, from his first cover illustration, Boy With Baby Carriage in 1916 to his last, Portrait of John F. Kennedy, in 1963. This was also the sixth cover for The Post in 1945. In 1945, there were ten Norman Rockwell Saturday Evening Post covers published. The original oil on canvas painting, 46 x 42 inches or 117 x 106.5 cm, is part of a private collection. 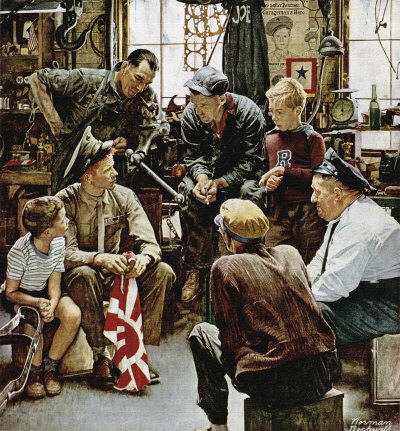 Norman Rockwell uses the topic of this painting to show us a study on hero worship. In this case, the object of that worship actually is a real hero. The setting pictured is Benedict's Garage, a local hangout in Arlington, Vermont, where Rockwell lived at the time. You can bet that, except for the story props that Rockwell used to convey his message, the garage looked exactly as it does in the painting. The center of attention and admiration in this scene is the young man in the Marine uniform. He is holding a captured Japanese flag, indicating that he fought in the Asian theatre of action during World War Two. Even without the rapt attention being paid to the Marine, we could tell that he is a hero by the newpaper clipping on the wall that proudly proclaims "Garageman A Hero." A smaller version of the picture in the newspaper hanging beside the clipping also indicates that we are inside the garage where the hero worked before the war and where he will likely return to work. Another indication that the other garagemen considered the Marine to be like family is the red white and blue banner that features one star. This banner, called a service flag, was given to indicate the number of family members who were serving. How big a hero is "Joe?" Well, one of his medals is the Silver Star. That is America's third highest award. The Silver Star is given for outstanding combat duty against an enemy on the battlefield. The other characters in the painting are all giving Marine Joe their complete attention. The two boys, modeled by two of Rockwell's sons, Jarvis, the oldest, and Peter, the youngest, are especially rapt. Homecoming Marine was only one of 322 Norman Rockwell Saturday Evening Post covers; Here is the list of Norman Rockwell Saturday Evening Post cover illustrations. All ages are represented in this painting from the boys to the oldest man sitting with his back to the viewer. Ages between are depicted by the Marine, the two mechanics and the policeman. All but the boys are likely veterans, though the two mechanics probably served between World Wars. What are your thoughts on this Norman Rockwell masterpiece on heroes? Do You Have A Great Story, Opinion Or Contribution About Homecoming Marine?